Welcome Thrill Seekers & Semi-Colonites to the Frivolity !! we prepare to enter the Chinese Year of the Earth Pig on February 4th. Agree. That is just way to funny!! And you lived to talk about it, WOW I spent a few years in UP MIchigan (near Marquette). Every spring, these large ants would come out of the ground for about a week. Their bite was nasty. I should know, I got hit once. One friend got hit 3 bites, had to spend the night in the hospital. I always think of the ant scene from the last Indiana Jones movie, (Temple Skull, something, something) where the ants hauled whole human bodies into their ground. Did you actually sit on that chair? 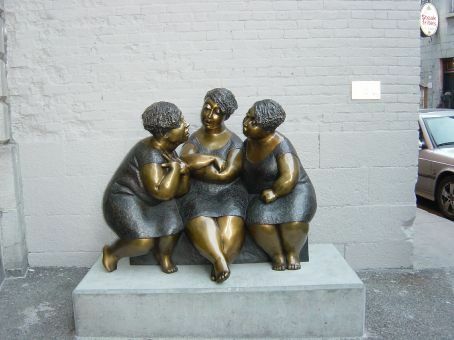 I love the 3 ladies statue. And you lived to talk about it, WOW .....Did you actually sit on that chair? and there were all these adults huddled around whispering....so I must have passed out. Like a honey badger! And the may the odds ever be in our favour that the public toilet we need to use, will flush!